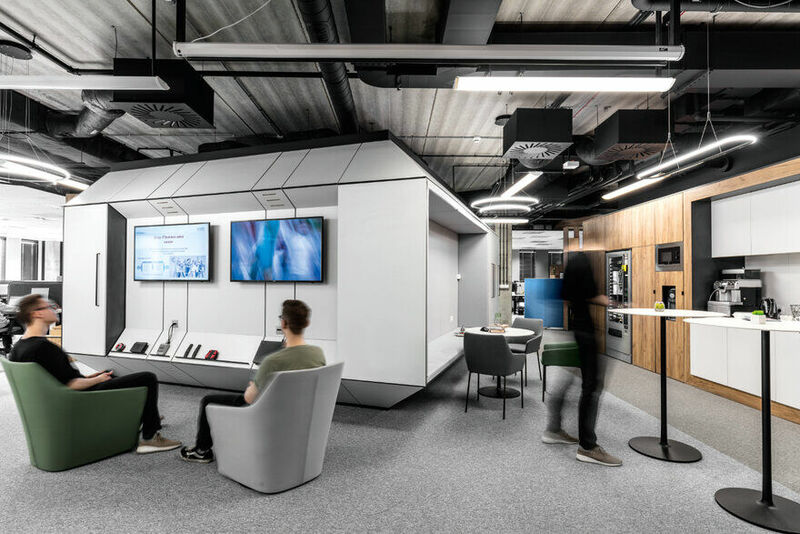 The IT Mocny office space with a multifunctional capsule in the middle, referring to the futurism of the 1960s, was designed by the ZONA Group in Poznań. IT departments are one of the most demanding groups of clients on the office space designing market. The dynamic development of this industry means that they expect, not only a multifunctional, modern and conveniently designed space, but also one that is interesting and referring to the style of work, the range of interests and last but not least the one attracting potential employees. 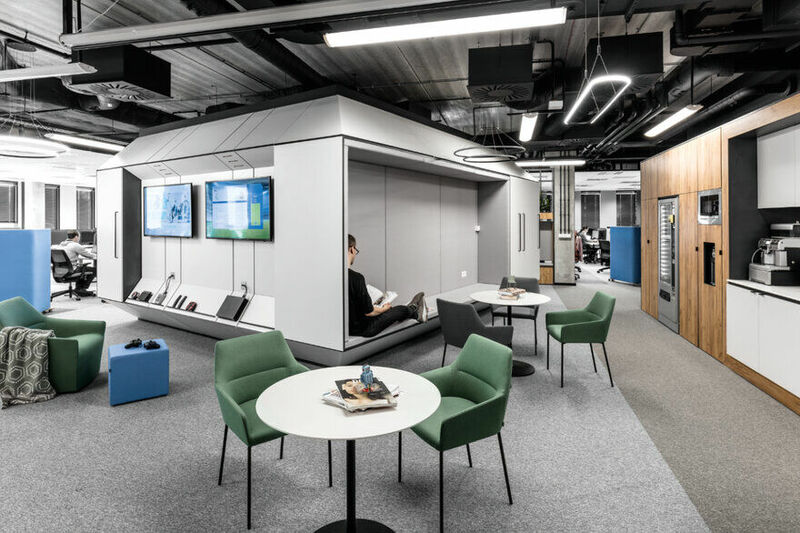 The office space designed by the ZONA Group for IT Mocny allows you to work in different conditions, on various projects, allows you to relax and integrate. 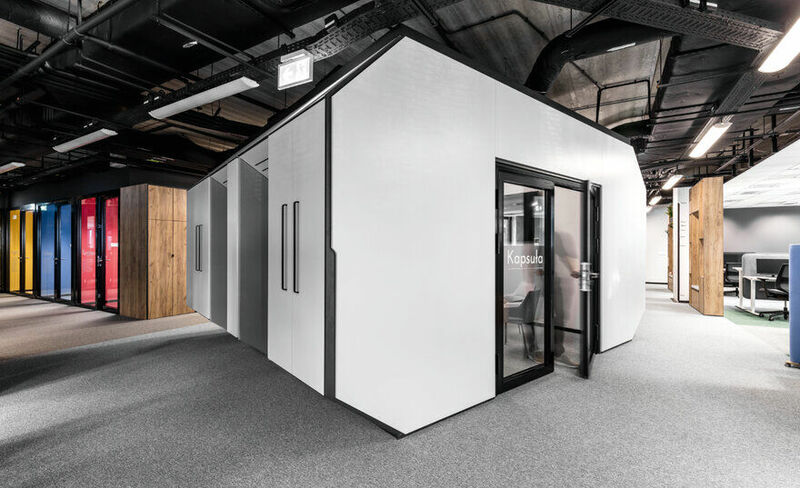 The project covers 550 square meters of office space divided into zones. 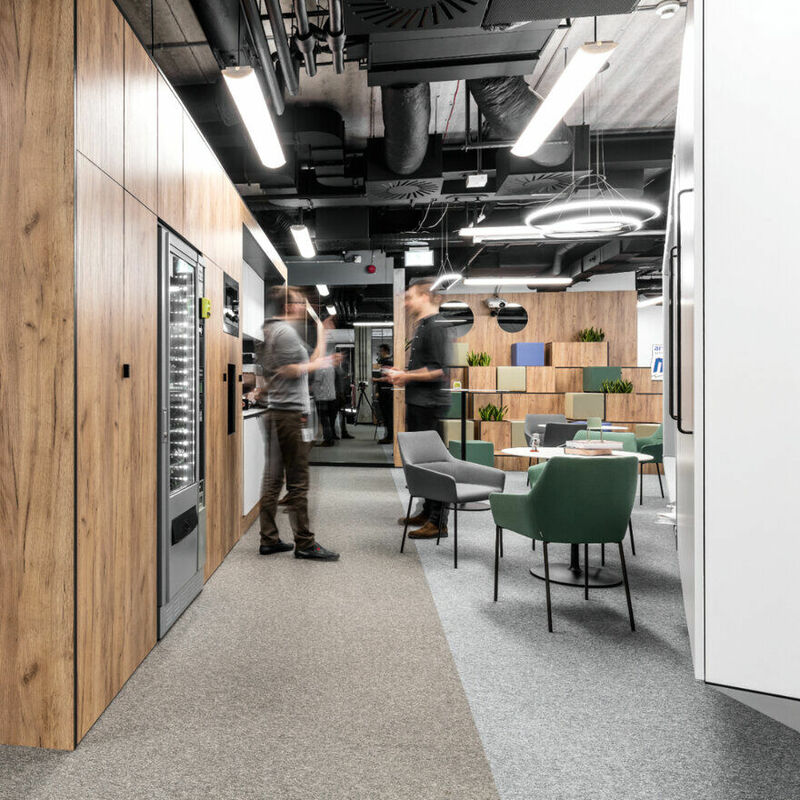 The architects decided to open the space as much as possible dividing it into work places at desks, the space for work in small groups, meetings, rest and integration. 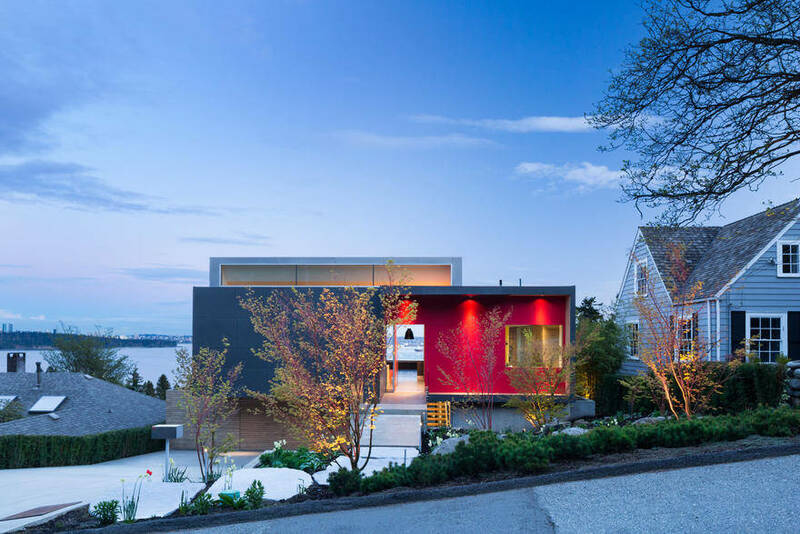 The goal was to propose a dynamic space that can be modified. There is no clear separation between different zones. 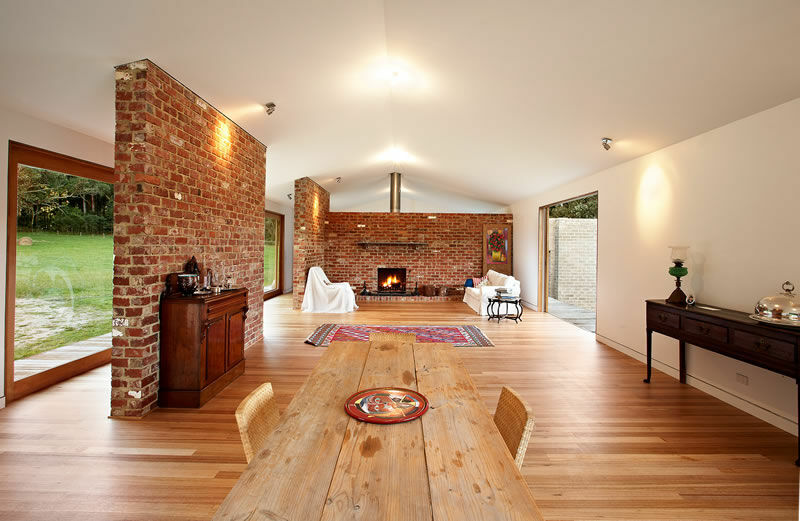 They interpenetrate with one another, giving the possibility to be freely adapted to the current needs of the client. 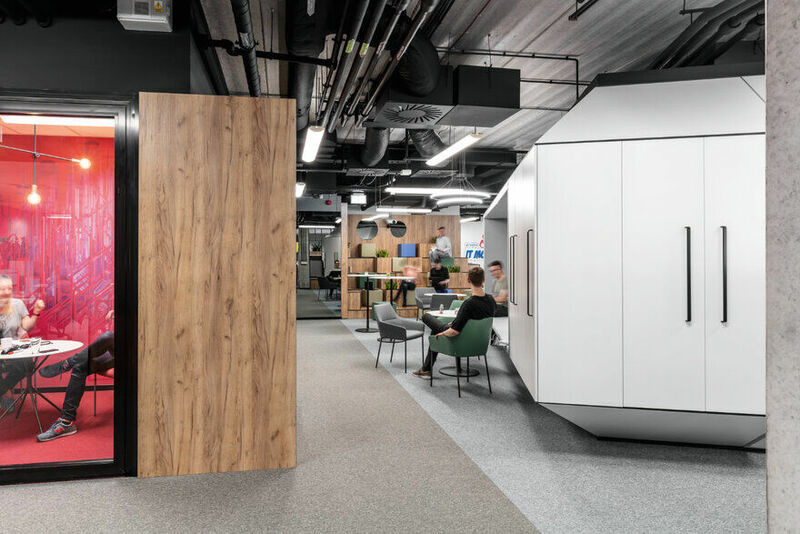 The whole project is concentrated around a multifunctional capsule, which, like a spaceship from the 1960s, landed in the middle of the office, dividing it acoustically and physically into two main zones – the work zone and the relaxation zone. The black and white capsule was set at an angle. Thanks to this the parts of the office merge with each other. This arrangement also allows better acoustic separation of the quiet and louder zones. 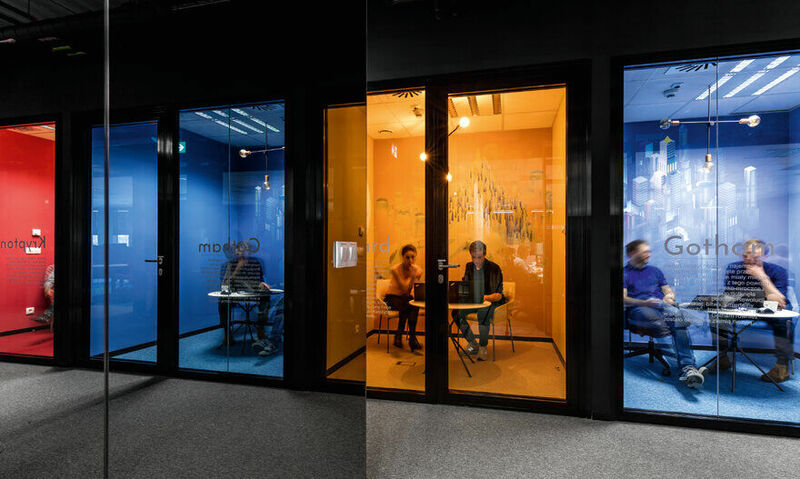 The largest meeting room is located in the capsule and its colors refer to futurism. The outer walls of the “cube” have been encapsulated with a furniture panel shaped do that it can have various functions. 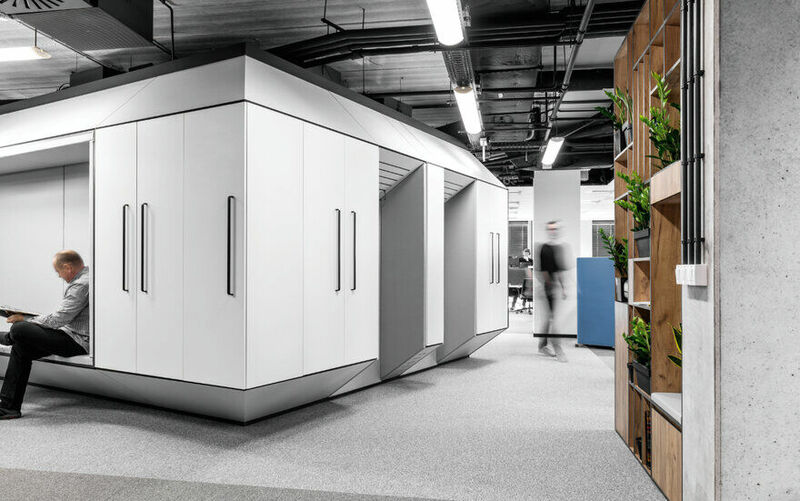 Telephone booths have been built in the office area, which in addition to the basic function, also improve the acoustic environment in the work space. 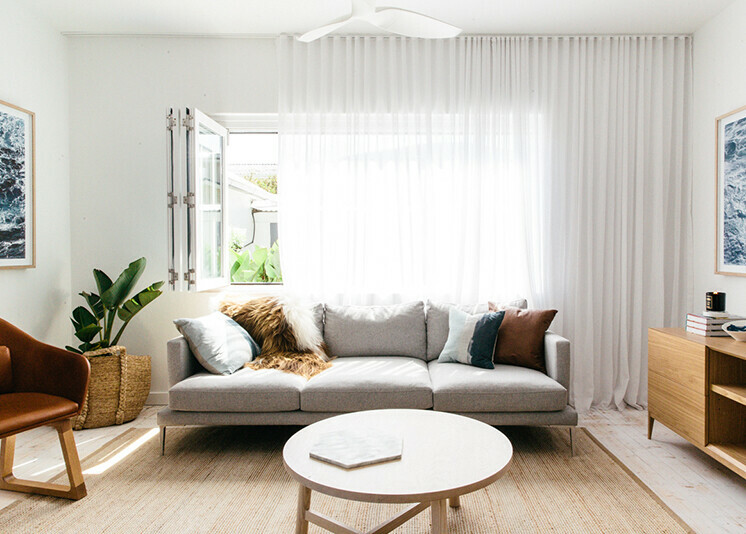 An upholstered seat has been designed to stand near the kitchen, while in the chillout zone, the space for consoles and multimedia games. In other parts of the project the architects “hid” the closets. The kitchen and relaxation zones have been combined to integrate the team in one place. The chillout zone, in addition to the wall of the capsule with consoles, was equipped with a ping-pong table, board games, also serving as meeting tables in less formal conditions. An integral part of the relaxation place is the auditorium, which can be modified in any way thanks to mobile cubes. The space is equipped with a projector hidden in the ceiling, giving the possibility for presentations for a larger group. The above mentioned cubes were made of furniture board – simple, in the form of pots with flowers or upholstered. This solution gives unlimited possibilities to employees who can create, with the help of blocks, the space they need. The area of work occupies the largest area. For convenience and ergonomics, it is equipped with a sit-stand electric desk. The architects decided to use contrast, not only in function, but also in style. 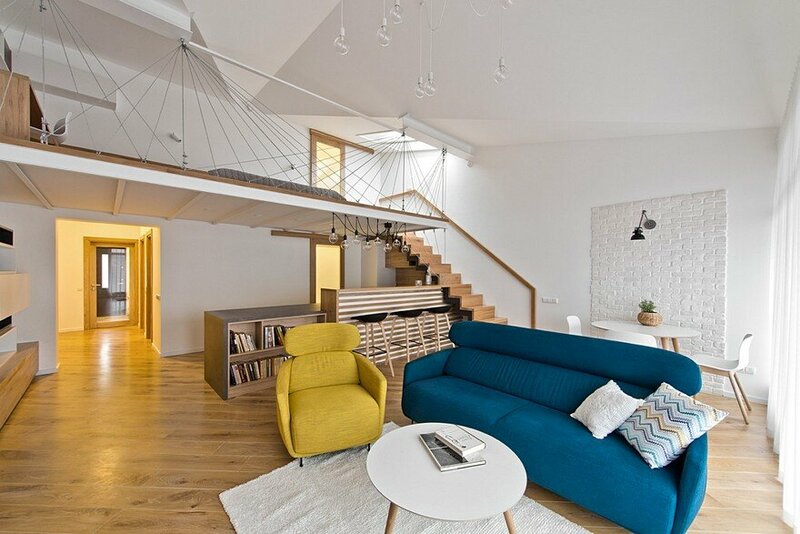 The work area, unlike the white-gray zone of relaxation, supplemented with wood and upholstery colors, is more colorful. The color stripes on the carpet are transformed into paint colors on the walls. On the one hand, the space is very dynamic, colorful, inspiring, but through the use of rhythm – set in ordered. 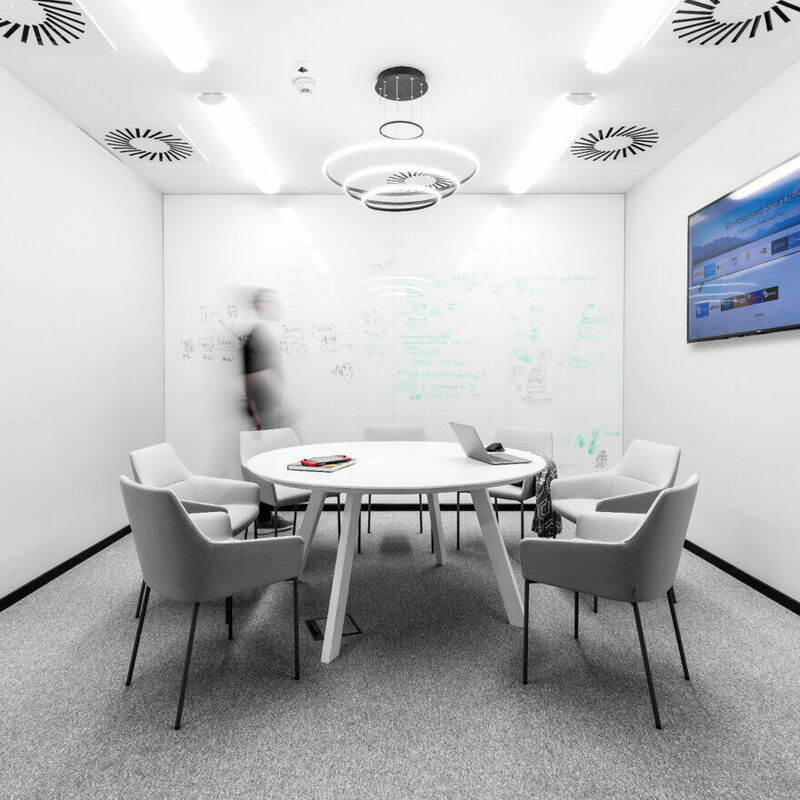 The whole is complemented by white desks and gray swivel chairs. The work zone is adjacent to small meeting rooms. IT Mocny has superheroes in their logo and identification. 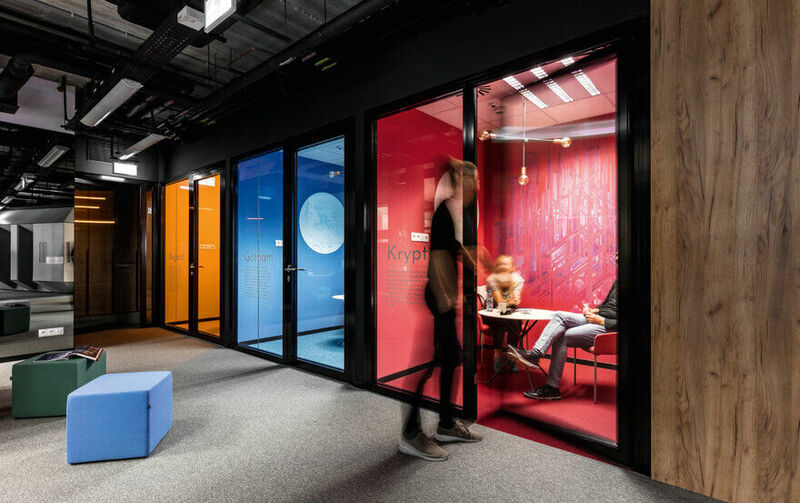 The architects have developed this theme by giving to the meeting rooms the names of cities and planets known from the comic books: Gotham, Asgard, Krypton. Each of the rooms is in the appropriate color repeated in the graphic. The graphic was created especially for the needs of the project, on the walls, floor and upholstery furniture. Three strong colors of the rooms: blue, red and yellow, give a strong accent and contrasts with the work surface. The mirrors on the walls doubled the effect. 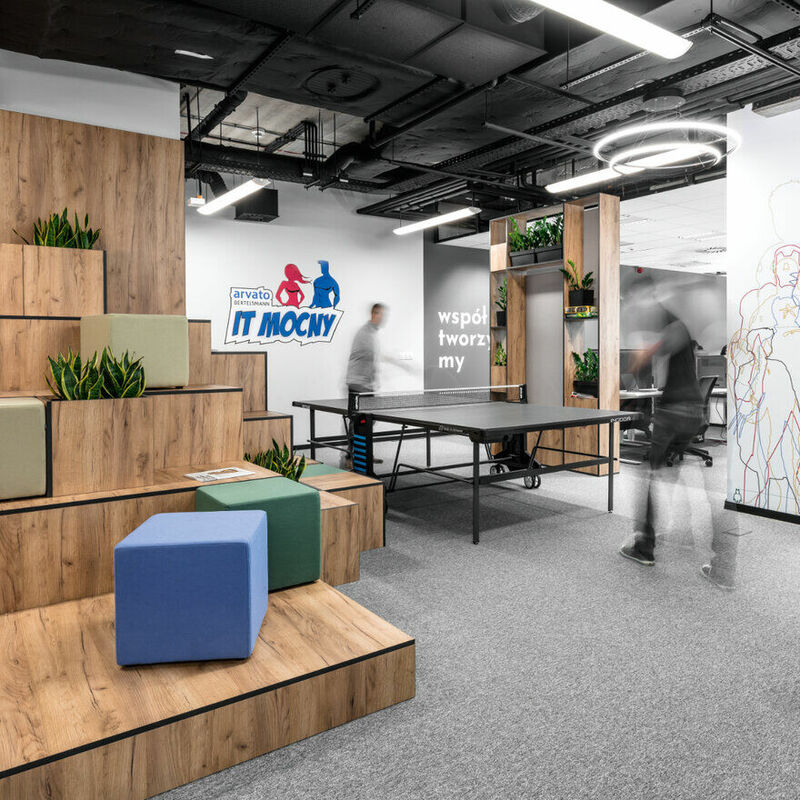 The IT Mocny office space has been complemented by graphics and decorative elements on the walls that give a visual identity to the interior. The entrance zone has workers lockers named after superheroes. Each employee is assigned to his superhero and not to boring numbers. Thanks to that he feels the part of the place from the very beginning. At the evacuation places, due to the limited arranging possibilities, the architects decided to use the graphics of the Czech artist Filip Hodas, which refer directly to the type of work performed. 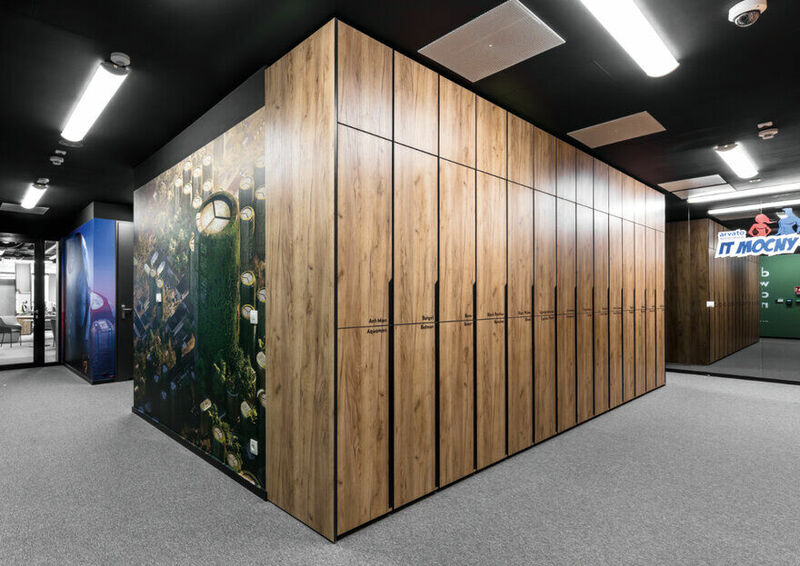 Artist’s graphics not only accurately complement the design, but also used in passages, add breath and space. The ubiquitous wooden elements and plants add a pleasant microclimate. The IT Mocny office space is a combination of functional, modern office zone solutions with a characteristic climate dedicated to the client. 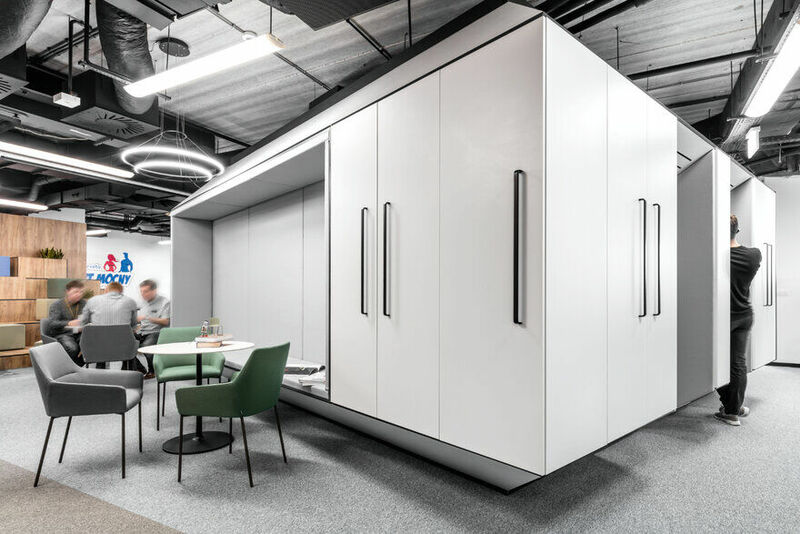 Thanks to the interpenetrating zones, the spaces for work and relaxation or integration and a formal meeting are not vividly separated. 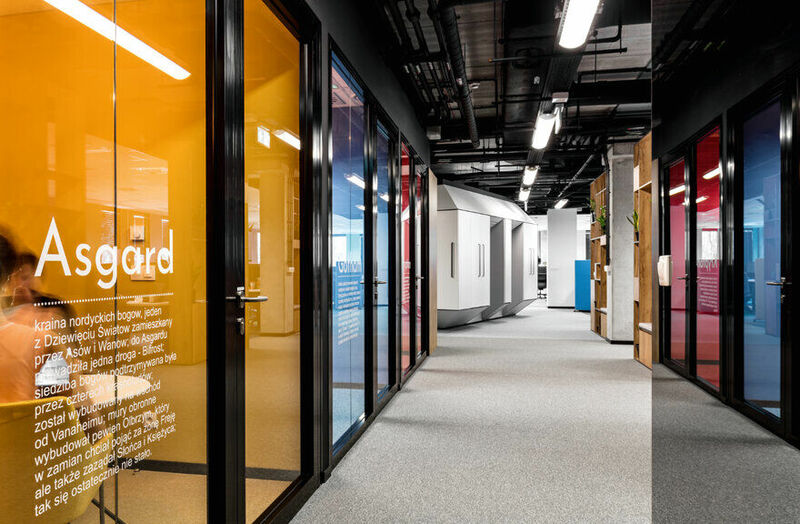 Nowadays, the way IT departments work requires the most dynamic space possible. Thanks to the applied solutions in the project, you can work individually, in groups or at a desk. 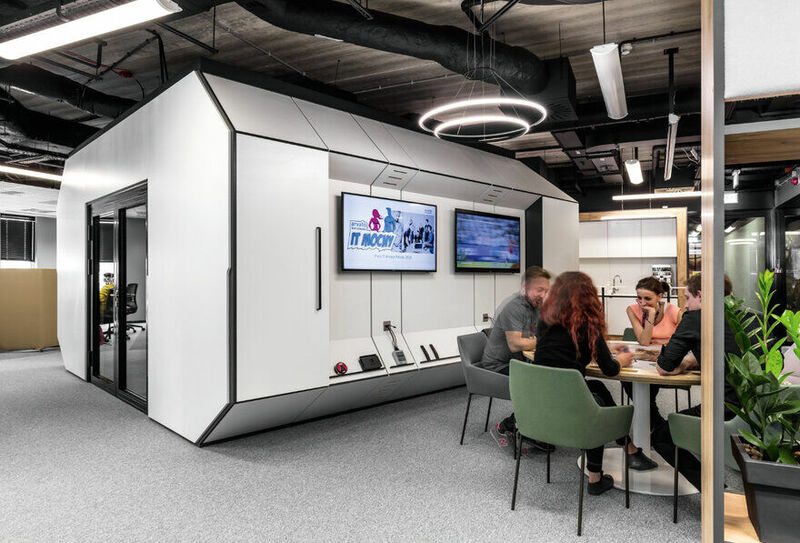 Mobile cubes give the opportunity to create space for an ad hoc team, and the capsule gives the sense of isolation and integration at the same time. The project offers a lot of possibilities, it lives its life, given by the client, and this allows for the most convenient solutions.